WIYDB? 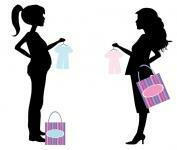 Dispatches from the Front Lines of Motherhood: MOM SHOW! November 7th 11-3pm! Our first ever showcase of local moms is coming up in 2 weeks! We've been working in partnership with the talented and hardworking representatives of lots of home based businesses to make a great holiday shopping opportunity for Guelph and surrounding area! From sweet treats to adorable booties... From relaxing fragrances to personalized jewellery - there will be something for everyone! While you browse, enjoy a snack at our Once Upon A Child cafe! We will have coffee, tea, and hot chocolate for purchase by donation, as well as cookies provided by our own Christmas baker, Julie! Don't forget, we are hosting a silent auction and donation bin with proceeds benefiting Guelph Beginnings! They are urgently seeking larger sized diapers and training pants (4-6), wipes, and hygiene supplies for both mom and baby! Everyone who donates a package of diapers will be entered in to a draw for a fantastic prize!